Image Caption – Law Enforcement United (LEU) awarded the Spirit of Blue Foundation $80,000 at their 9th Annual Road to Hope Memorial Ride arrival ceremony. Presenting the donation from LEU was (left to right) Scott Humphrey, Mike Gary, David Heritage, Cory Reader and John Mapes. Receiving the donation was Ryan T. Smith (center), Executive Director of the Spirit of Blue Foundation. ROCHESTER, NEW YORK – July 13, 2017 – The Spirit of Blue Foundation is excited to report that it has received a $80,000 cash donation from the National Board of Law Enforcement United (LEU). 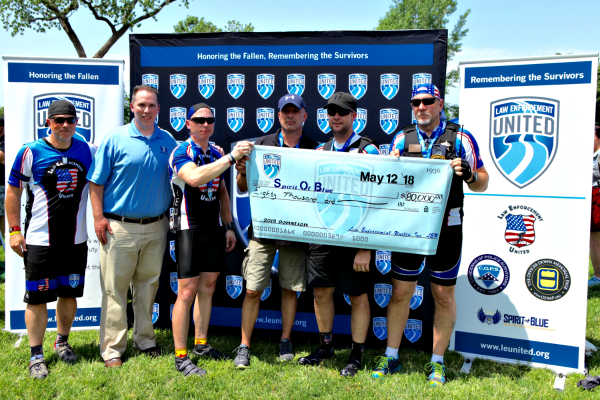 The gift was presented to the Spirit of Blue at LEU’s 9th Annual Road to Hope Memorial Ride arrival ceremony held this year at East Potomac Park’s Hains Point in Washington, DC on May 12, 2018. Nearly 1,000 active duty and retired law enforcement officers, along with a number of surviving family members of officers who were lost in the line of duty, rode over 250 miles to honor the sacrifices that fallen officers have made in service to their communities and the families they leave behind. Law Enforcement United consists of chapters in Virginia, Maryland, Pennsylvania and New Jersey along with riders who join from a host of other states across the country. Each rider raises $1,250 on their own to participate in the annual Road to Hope Memorial Ride, which covers the cost of their participation and generates the funds donated to select law enforcement causes. A subset of riders also participate in Project Active Armor, where riders wear ballistic vests along the entire route of the ride to demonstrate that with today’s body armor it is not only possible to bike 250 miles in their vests, but that there shouldn’t be any reason law enforcement officers can’t wear their armor while on duty. In addition to the gift made to Spirit of Blue, LEU also presented $78,000 to the Officer Down Memorial Page (ODMP) and $592,000 to the Concerns Of Police Survivors (C.O.P.S.) national organization. In total, LEU has raised over $5,750,000 since it was founded in 2009. Since 2011, the Spirit of Blue Foundation has awarded 63 grants in 28 states valued at over $300,000. The grants have varied from patrol rifles, body armor, riot control gear, AED’s, K9’s, forensic software, flashlights, Police/Youth Dialogue training, night vision optics, LED flares, ballistic helmets and self-contained breathing apparatus. The Spirit of Blue Foundation deeply appreciates the generosity and support of the national LEU organization, its Board of Directors, their regional divisions and the riders who participate in the Road to Hope Memorial Ride each year.